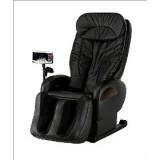 Massage Chair Reviews – The Sanyo HEC-DR7700 Zero Gravity massage chair features an Exclusive Stiffness Detection Sensor. It has state-of-the-art controls and sensors that deliver a status report of the massage and stiffness on a reversible color flat panel screen. The quad roller massaging mechanism delivers a full 31” Vertical stroke in order to ensure that the full length of your back is reached.